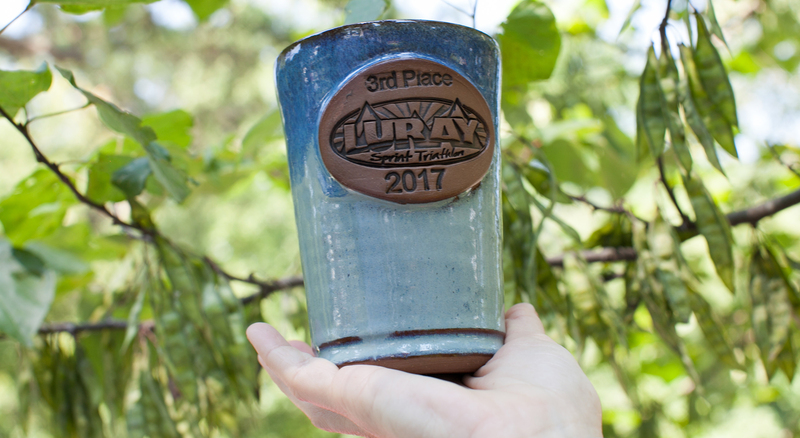 Luray Triathlon decided to change up the podium awards this year and commissioned local potter Cathie Miranda Potterylady to hand make each pottery award. 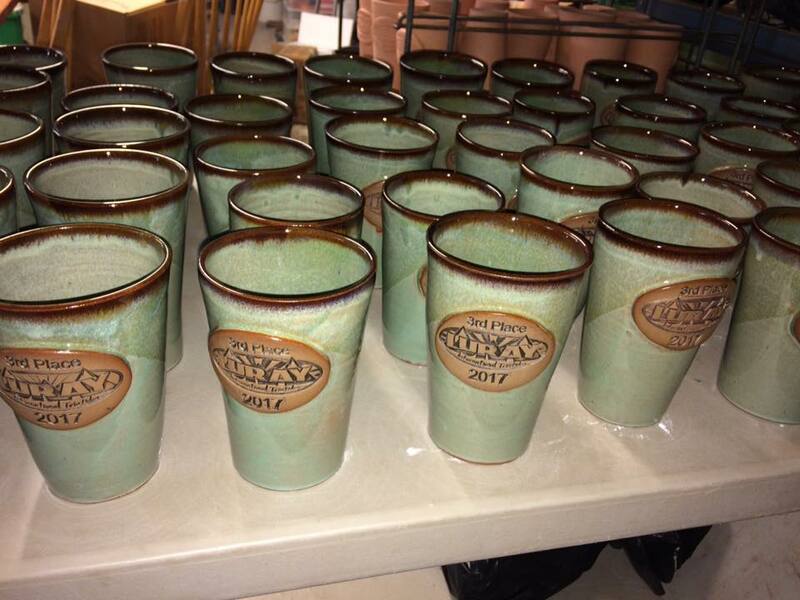 The pottery awards were either pint glass shaped or mugs, ranging from 18-20oz. 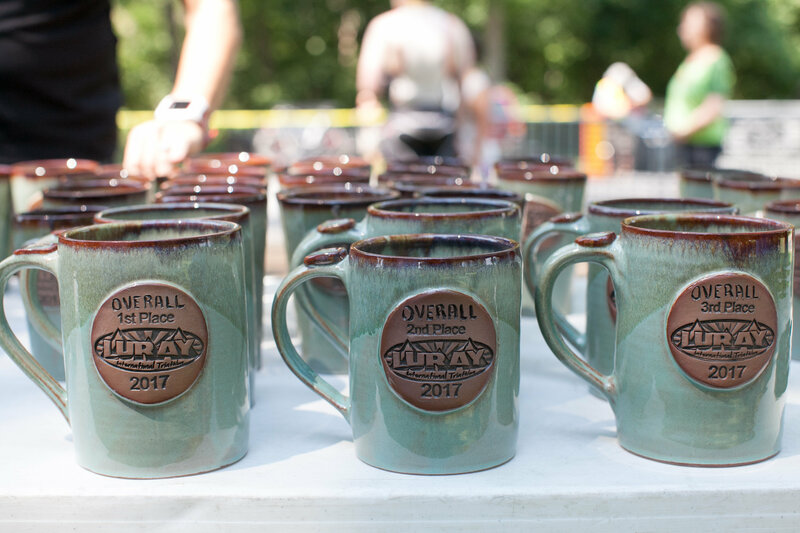 When deciding on a new style of awards, Luray Triathlon Race Director, Ken Racine, wanted to use a local potter and have each award be a custom, hand crafted piece. After meeting with Cathie and seeing some of her work he knew this would be a perfect fit. Race Participants couldn’t agree more. The overwhelming support of the new style of awards for the Luray Triathlon was amazing to see. Some of the feedback received on the post-race athlete surveys state, “The awards were fantastic, a great improvement to the race!”, “LOVE the pottery pint glass prizes!!!! !” , “I loved my award!!!!”. As a bonus local brewery, Hawksbill Brewery, offered the winning athletes a discount if they took their mug into the brewery and got it filled up. We asked Julie Patteson, winner of both the Women’s Luray International and Sprint Triathlon, What did you think about the pottery awards? She told us, “The pottery awards are honestly the coolest awards that I’ve gotten from a race. They are also the only awards that I have on display in my house – they’re already up on the bookshelf in my living room. I love that they are unique and artistic without being flashy about a win”. Another Luray Triathlon participant David Raimist said, “They are awesome!!! So unique and still handmade by local artisan. Everyone I spoke to was excited to see/receive them. So much more usable and unique than other awards”. 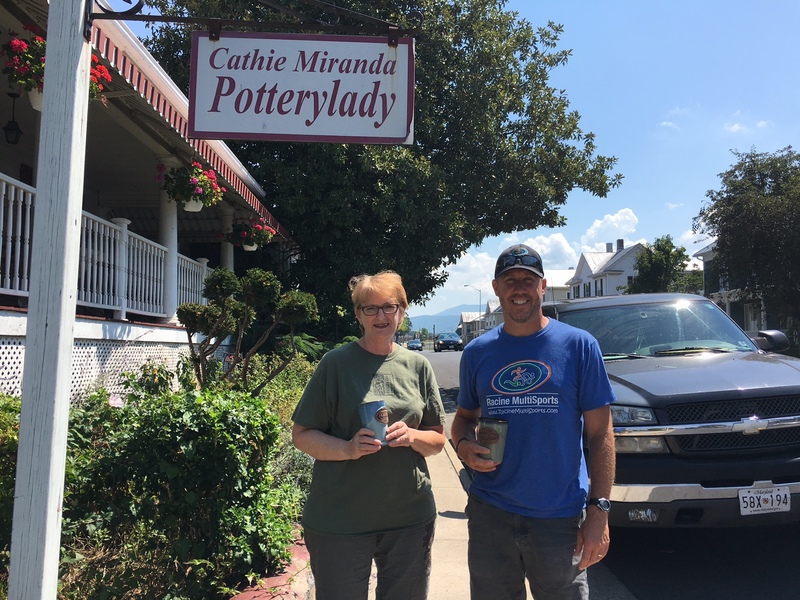 We had a chance to catch up with Cathie Miranda, whose studio is located at 317 East Main Street in Luray, VA, and asked her a few questions about her pottery and her Luray Triathlon experience. I was introduced to pottery in ninth grade by my teacher, Mr. Joseph Sullivan. After hanging wallpaper for twenty-five years, I went back to school to study ceramics. The Potterylady became a business on May 4, 2010. The retail store, CATHIE MIRANDA, POTTERYLADY, opened the following November at 317 East Main Street, Luray, Virginia. Tell me about your pottery business. My studio, located out in back of my home, in a free-standing, cinderblock building I had converted from a garage. I have an electric kiln, two electric and one kick wheel, a pug mill, and an extruder. All my pottery is thrown on the wheel or hand-built. Every piece I produce is hand-made and therefore unique. Once the desired shape is formed, trimmed, if necessary, and allowed to set. it can be carved and/or designed while the clay is still moist and pliable. Thoroughly dry, it goes into the kiln to be bisque fired. After a cool down, I apply what needs to be glazed (or waxed) before a second and final glaze firing. After cooling down, each piece is visually inspected for any sign of defect, and sanded, if necessary. Commissioned pieces are boxed and delivered. Pottery for retail is displayed in the store, located on the first floor of my home on Main Street in Luray. Where are some other places we can find your work? Besides local workshops and commissions, I offer pottery at The Warehouse Art Gallery, The Hawksbill Trading Company, Shenandoah Moon, and the Copy Shop, all located in the town of Luray. We also participate in the Festival Of Spring and Page County Heritage Festival here in Luray, the Blackberry and Apple Butter Festivals, on Skyline Drive, in the Shenandoah National Park, and The Treasure Mountain Festival in Franklin, West Virginia. 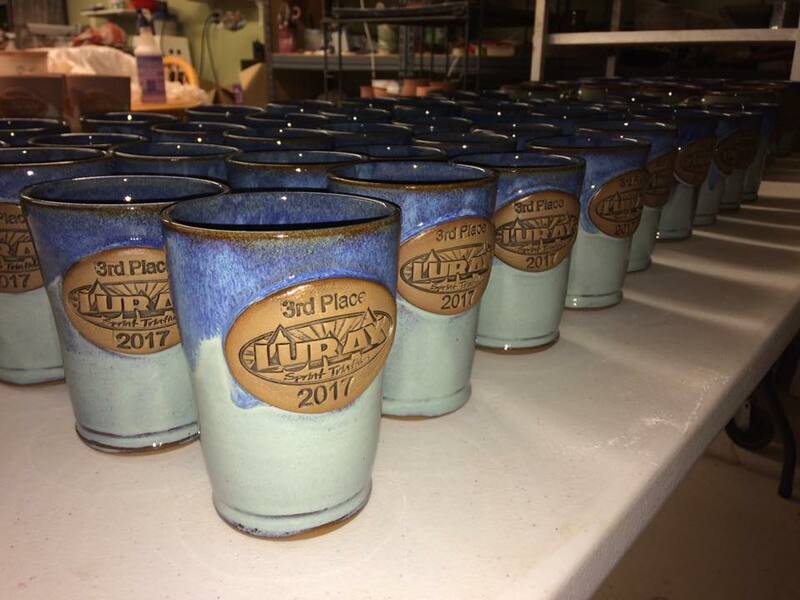 The Potterylady has been supplying designer trophies and medallions with Christopher Gould for the Tour of page county, Page Valley Road Race, Shenandoah Time Trial, Shenandoah speedway points race and the Luray Caverns CX cycling events every year in Page County since 2012. Beginning in 2011, through 2015, the Potterylady contracted with Upsilon Ventures in New York City to sell pottery in Bryant Park during the October-January Winter Holiday season. What did you think about doing the Luray Triathlon awards this year? I admit to being a bit nervous when asked to provide the awards for the 2017 Triathlon here in Luray. It inspired me to do my best. My view is that the athletes pursue their passion as much as I do mine. I was happy to learn that the awards were well received by the recipients. This county, this entire valley, benefits from events like the Luray Triathlon. They offer something that big business, big anything, cannot provide. Cathie Miranda, Potter and Ken Racine, Luray Triathlon Race Director outside the Cathie Miranda Potterlady studio.